Pediatric Acupuncture is not new. It has been used to treat children for thousands of years. It can successfully treat a wide range of conditions in babies to adolescents. At Seattle Fertility acupuncture our acupuncture for kids is safe, nearly painless and has many needle- less options, including cold laser. We also use pediatric tui na (Chinese massage), diet changes and supplements. 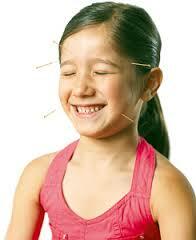 For children, acupuncture focuses on relief of symptoms, treating the root cause and prevention of future illness. Parents have an opportunity to influence their children’s future health now. You will be introduced to the Chinese Medical way of viewing health. Acupuncture supports each stage of a child’s development and addresses inherited imbalances. Treatments often involve a dietary assessment of the child (and the breast feeding mother). It’s not just what you eat but how fresh it is, the way the food interacts with the child’s constitution, and how and when you are eating. Lifestyle factors are very important in acupuncture for children. Our modern busy lifestyle can have a profound impact on the health and development of a child. Chinese Medicine can offset these effects. Supporting the child through acupuncture is especially important if the parents have gone through ART or if the parents are older.